Jambalaya is a very personal thing. 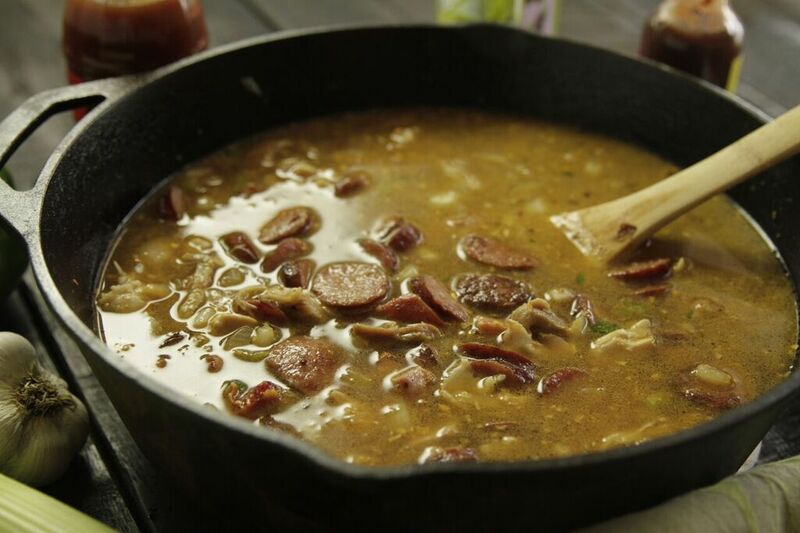 In south Louisiana, it seems we all have a special way to make it or a custom ingredient we like to add. 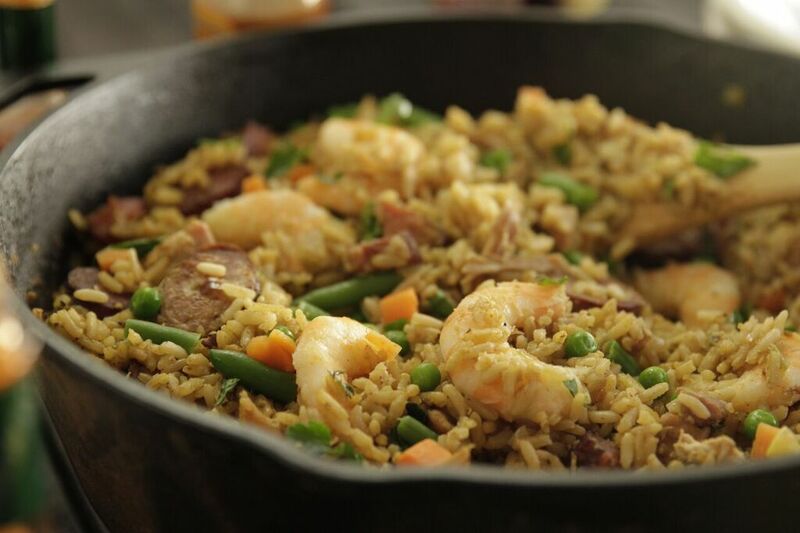 And since the base of any great jambalaya consists of rice, seasonings and spices, it’s easy to personalize it based on the proteins, aromatics and vegetables you choose to use. 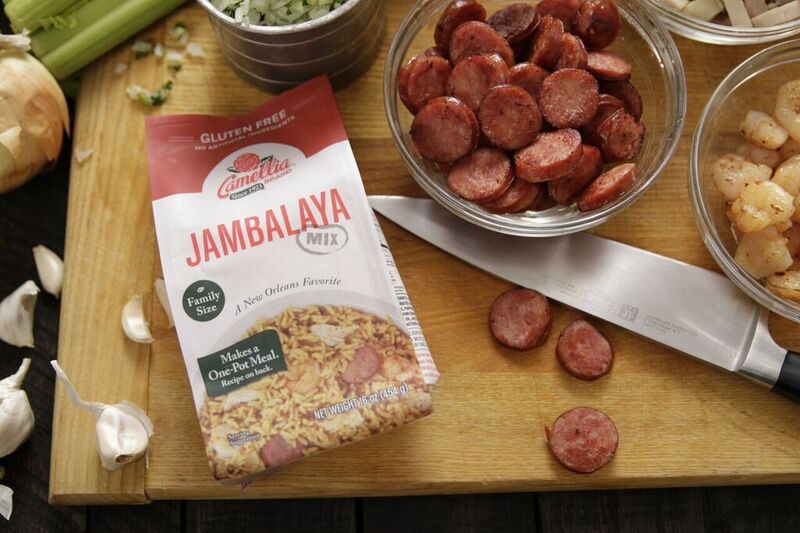 Make your jambalaya the way you like it by adding (or not) all kinds of delicious seasoning meats, sausage, seafood, chicken, veggies and more. 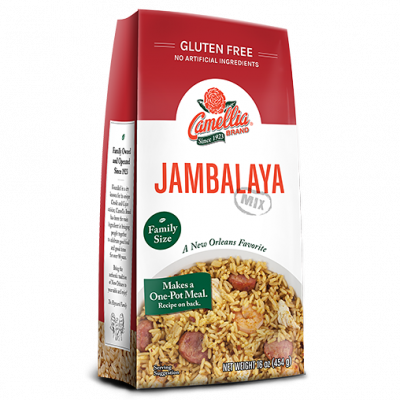 And with Camellia’s Jambalaya dinner mix, the process is simple and fun. This mix contains rice, seasonings and spices that are classic and full-flavored – so it’s not too mild and not too spicy – and will work well with whatever you choose to throw in the pot. There’s a recipe on the back of the bag, but think of it as a mere suggestion. It’s really all about making it your own. 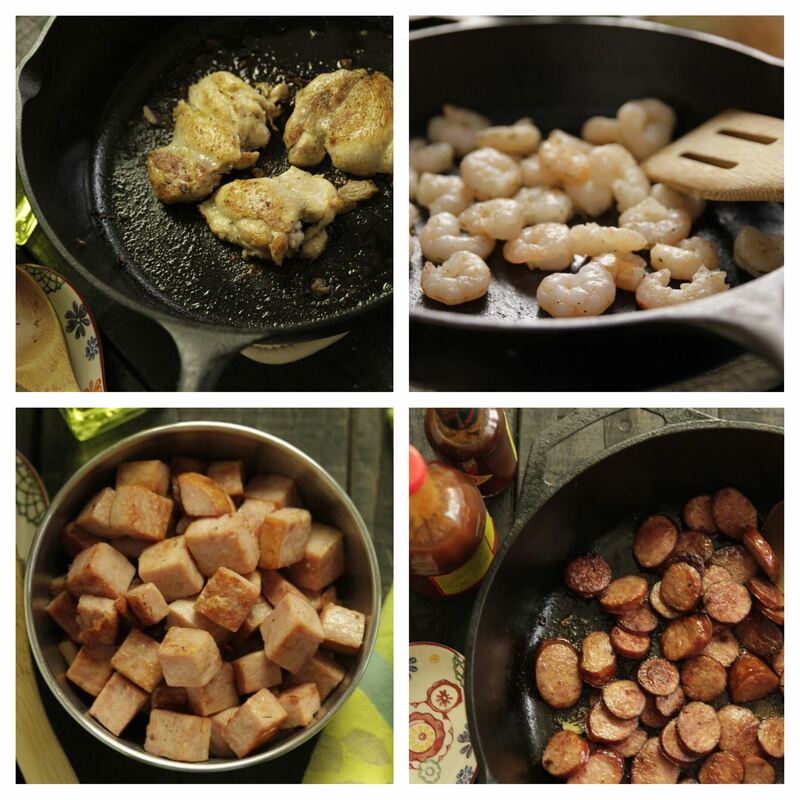 For this make-it-your-own recipe, we’re going Cajun-style and using a cast iron pot for flavor and authenticity. 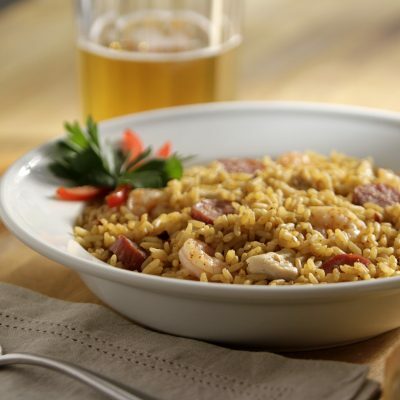 Cajun-style jambalaya doesn’t use tomatoes and gets its brown hue from searing the meats in a cast iron pot, and then cooking the jambalaya in the brown bits scraped off the bottom of the pot. 1. Brown the meats. 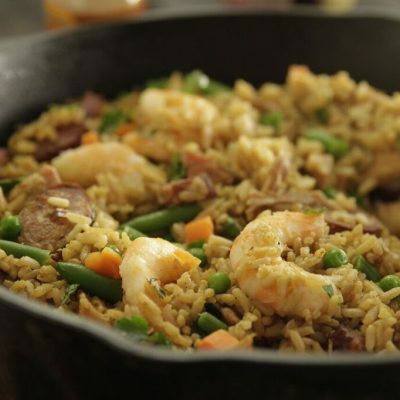 Cook 1 3/4 pounds of sliced, smoked sausage, boneless, skinless chicken thighs and shrimp – or whatever combination of meats you prefer – in a cast iron pot. Browning the different meats individually gives you control over the cooking time for each, lets you get a good sear and brings out their flavors. And don’t wash the pot in between meats! 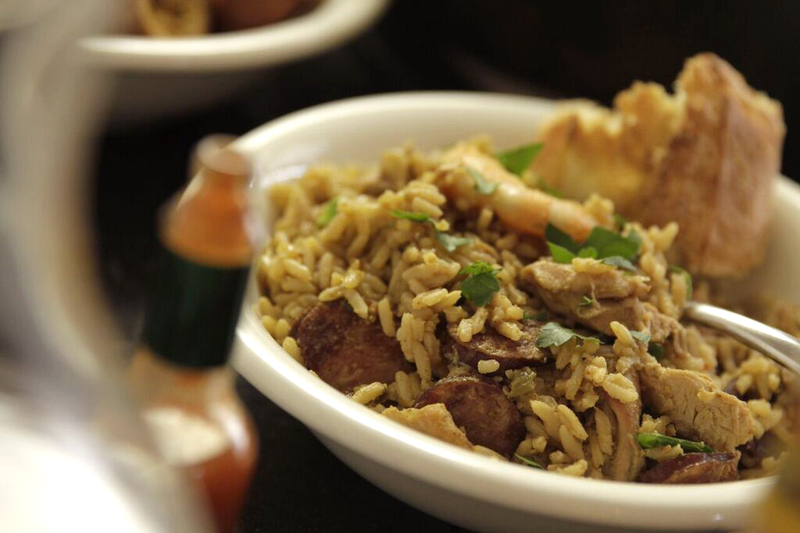 Be sure scrape up the brown bits that start to stick to the bottom of the pot – they’re the key to a flavorful Cajun Jambalaya. Let the chicken thighs rest a few minutes after cooking, and then chop them up. Set aside all your chopped meats – they’ll be added back to the pot a little later. 2. Sauté aromatic vegetables. Next, in the cast iron pot, sauté the trinity — a combo of 1 chopped onion, 2-3 stalks chopped celery and 1 chopped green bell pepper — plus about 4 ounces chopped tasso, in a glug of olive oil. 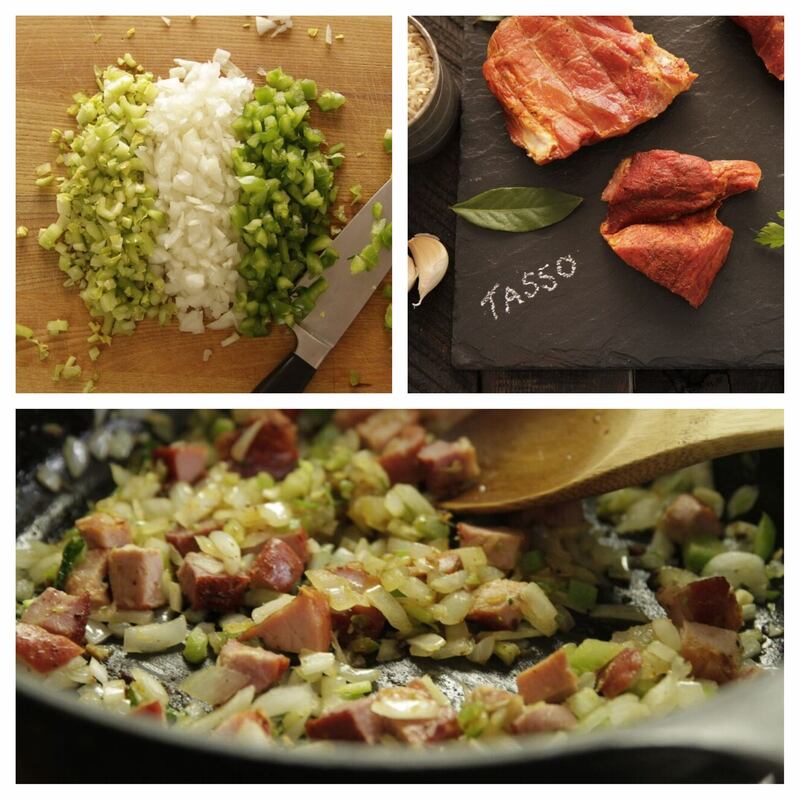 (A delicacy widely available in south Louisiana, tasso is spiced, cured, smoked pork shoulder that adds amazing flavor and kick to everything from red beans and gumbo to jambalaya. Can’t find tasso? Try substituting smoked ham, but be forewarned – it won’t be as deliciously spicy.) Cook until the vegetables soften; the aroma lets you know you’re on the right track. You can use pre-chopped trinity (also widely available in south Louisiana) if you like, or chop your own and get in a little kitchen therapy. 3. Add everything to the pot. 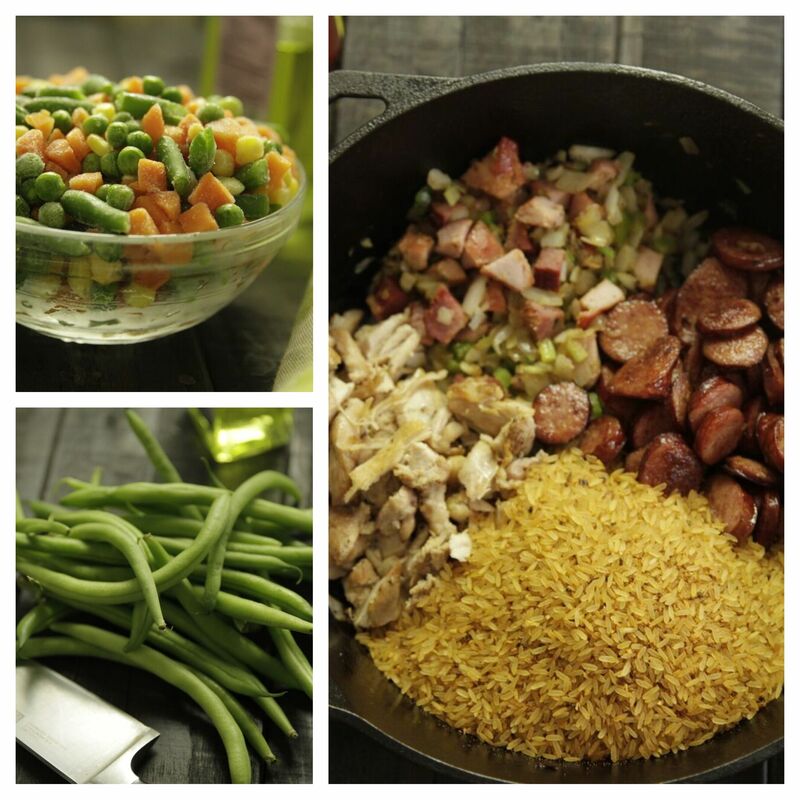 Now add all of your cooked meats back to the pot (except for the shrimp), as well as the Jambalaya Mix, and if you feel like adding a little bit of color, perhaps a bag of frozen veggies or fresh, trimmed green beans. Then add 5 cups of water, and give it a few good stirs. Bring to a boil, reduce heat, cover and simmer for 25 minutes. If using, add the cooked shrimp to the pot, cover and simmer for 5 minutes more. 4. Remove from heat. Remove the pot from the heat and let stand, still covered, for 5 minutes. Stir to check that all the water has been absorbed, and taste for seasoning. Add some chopped fresh parsley, if you like. 5. Feed your crew. Then round up a crowd, and pass out hot, heaping bowls to all your friends and family – because this is one-pot party food that’s thoroughly hearty and satisfying. Serve with crusty bread, a selection of hot sauces and a smile. 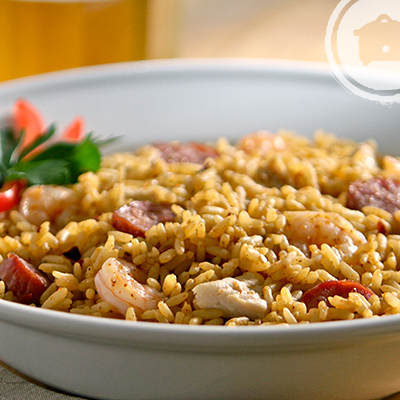 If you’re interested in making Creole-style Jambalaya (also called “red jambalaya”), you might want to have tomatoes on hand, as that’s the basis for orange- or red-tinged Creole jambalaya. The tomatoes can be fresh or canned, and you can add tomato sauce as well. 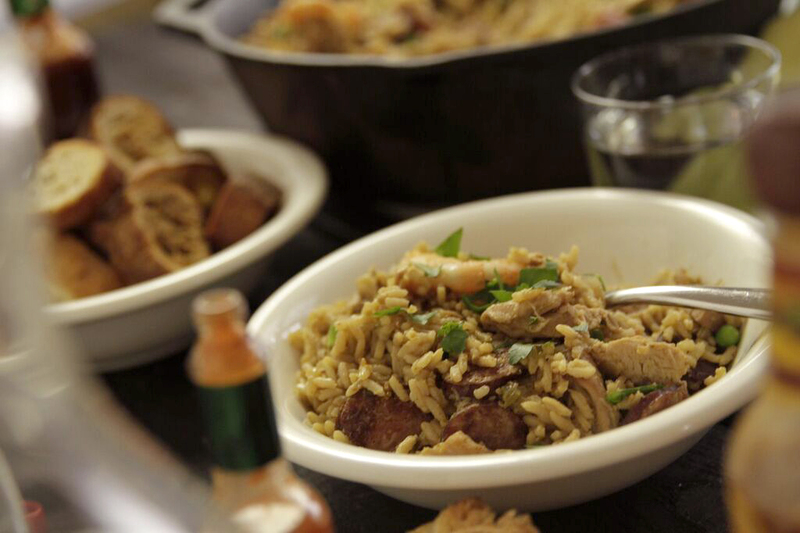 Find out more about the differences between Cajun and Creole jambalaya. Happy cooking!